Finley the Pig, courtesy Amy Capiross-Watterson. In 2013 and 2017, I was elected as a Council member in Leechburg, a town of about 2,000 residents. My platform included using the tools of public sociology to promote civil society. Among the many successes and failures of my tenure, none is as interesting, maddening, or farcical as a year-long dispute over a pet pig named Finley. In retrospect, the saga of “Finley the Pig” says quite a lot about the usefulness of public sociology in the political sphere and beckons for greater development of method and measure on local publics and moral dilemmas in public sociology. In September 2017, Mayor Wayne Dobos, a Vietnam Veteran and retired steelworker, hand delivered a copy of a pet ordinance to Destiney and Cody Griffith, a newlywed couple who had recently moved to Leechburg. 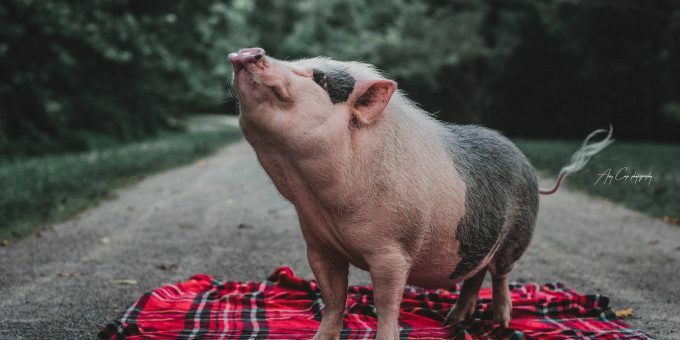 The Mayor explained that a neighbor had filed a complaint: Finley, their beloved pot-bellied pig, violated the borough’s livestock ordinance. Dobos gave the Griffiths two weeks to remove their pig from the borough. If they did not, he would instruct the police to enforce the ordinance. Rather than acquiesce, the Griffiths decided to fight. They cancelled their honeymoon, created a change.org petition for Finley, called the local television news station, circulated the Mayor’s ultimatum on social media, and encouraged residents to show up to Council meetings to express their disapproval of the Mayor’s actions. The Griffiths demanded that Council acknowledge Finley as a pet and permit them to keep him in the borough. The news of Finley spread quickly, not only locally, but across the country. The Griffiths’ petition garnered over 6,000 signatures—three times the number of residents in Leechburg. Outrage, mostly in the form of support for Finley, poured out across Facebook and other social media sites.For many in Leechburg, the issue went beyond a couple’s pet pig. Finley became a symbol for all kinds of fears around community change, law and order, and personal freedom. For many in Leechburg, the issue went beyond a couple’s pet. Finley became a symbol for all kinds of fears around community change, law and order, and personal freedom. Noticing how heated the situation was becoming, I moved to temporarily suspend the ordinance, stopping the clock on Mayor Dobos’s ultimatum. It would allow some time to pass, for cooler heads to prevail, and for the Council to visit remedies with our solicitor. Our next Council meeting drew the largest crowd I’d seen in my tenure. Where, normally, attendance hovered at about four or five locals, this meeting saw 40-some residents alongside television crews and journalists. The Mayor came ready to punch; he demanded that order would be maintained, instructed police to arrest provocateurs, and delivered a statement chastising the Griffiths for their activism and undercutting Destiney’s assertion that Finley was a therapy animal helping with her anxiety disorder. Attendees, including Destiney’s father—a towering, muscular man—called the Mayor’s comments disrespectful. Council later concluded that the pet ordinance had not been regularly enforced, and that other residents were clearly in violation, too. Among the pets that would need to be ejected from Leechburg were not only Finley, but goats, chickens, ducks, and a peacock, too. It looked as though suspending and redrafting the ordinance were the only possible paths. Yet, rather than have Council draft a new ordinance, I assembled a citizen-committee composed of both Finley supporters and skeptics to develop a draft that would reflect community standards. In the following months, I used my research skills to distill the many phone calls and meetings with community members on the issue into three sensible requirements about pets. First, the new ordinance should not burden neighbors with unwanted sights, sounds, or odors from animals. “Not everyone in town likes animals, so we shouldn’t pass an ordinance assuming that everyone does.” Second, there must be limitations on what animals would be allowed. Many were concerned that the town would devolve into a “circus” or “petting zoo.” Finally, the ordinance should not attempt to solve other issues related to animals in the borough. Some worried the redrafting would become a back-door to evicting their large-breed dogs; others thought we might disband the colony of feral cats living near the train tracks. With these three tenets in mind, the solution eventually made both supporters and detractors happy. The ordinance seemed like a true reflection of civil society.I assembled a citizen-committee composed of both Finley supporters and skeptics to develop a draft that would reflect community standards. In the following months, I used my research skills to distill the many phone calls and meetings with community members on the issue into three sensible requirements about pets. After nine months of discussion, cooling off, and an election, we were ready to vote on the ordinance in May 2018. The new ordinance focused on pet and property size rather than species, mandating owners of outdoor pets to have enough property so pens and enclosures could set far enough away to not bother neighbors. The ordinance passed in a narrow vote. In the June meeting, the Mayor vetoed the new ordinance citing issues unrelated to its drafting or content. I immediately motioned for an override vote, but came up one vote short. To everyone’s surprise, Mayor Dobos’s veto stuck. In the July meeting, the solicitor determined that his veto reverted the law back to the old ordinance, which was under suspension. Finley would be able to continue to stay in town, but Council would be back to square one on a new ordinance. In the meantime, the once-feuding neighbors had more-or-less worked out their issues about Finley on their own. Council members were ready to move on to other issues—like what to do about Kevin the Peacock. Public sociology’s ideal supports civil society (community standards) against state despotism and market tyranny, but sociologists are left without a common method and measure for what action should look like. The Finley-the-pig saga provides some useful insights. First, the common examples of public sociologists in elected positions are most often leaders on the world stage, suggesting the sociologist hoping to make change has to “go big or go home.” My experience suggests instead that the most effective method is “go small and build up.” Local issues, as trivial as they may seem, are often analogs of fundamental debates in broader civil society. If sociologists can help their communities navigate local debates, they will make fundamental, albeit anonymous, contributions to the national discourse.When it comes to measures in public sociology, my experience in local government can teach us that successes are embedded within failures. Critics of public sociology state that civil society is “hardly the idealistic public sphere” and unlikely to be receptive to sociologists’ prescriptions for change. This overlooks the notion that most issues in civil society are localized and thus require localized public sociology. The Finley episode wasn’t just about a pet ordinance; it was a symbolic vehicle for discussions conceptualizing community change, enforcing order, and ensuring personal freedom. As I helped my community work on these issues, my efforts were welcomed by all and accepted by most. I even became known as the Council’s “voice of reason.” More concretely, I received 68% of the vote in my reelection. This level of reception for sociological prescriptions for change is especially striking considering that I reside in a Southwestern Pennsylvania county in which Trump received 74% of the vote in 2016. It will always be difficult for public sociologists to stimulate government into being a vehicle for civil society, but it’s not impossible. In my experience, it can work at the local level. Now, go run for local office! Christian Vaccaro is a sociologist at Indiana University of Pennsylvania. He is also a Council member in Leechburg, PA and serves on the local library’s board of directors. Great story but consider me confused. Where was the "public sociology" in this tale? I appreciate the concluding points but I am not sure how Christian took advantage of his sociological training/imagination/tools. It seems the most important thing that happened was delaying the decision long enough for cooler and more pig-friendly heads to prevail. Please explain to this interested party.